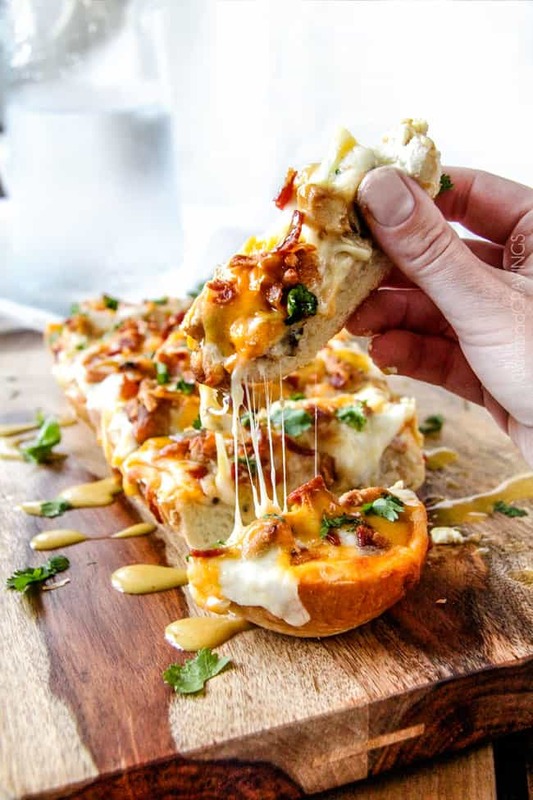 Cheesy Alice Springs Chicken French Bread Pizza – everything you love about the Outback chicken but in easy, delicious pizza form! 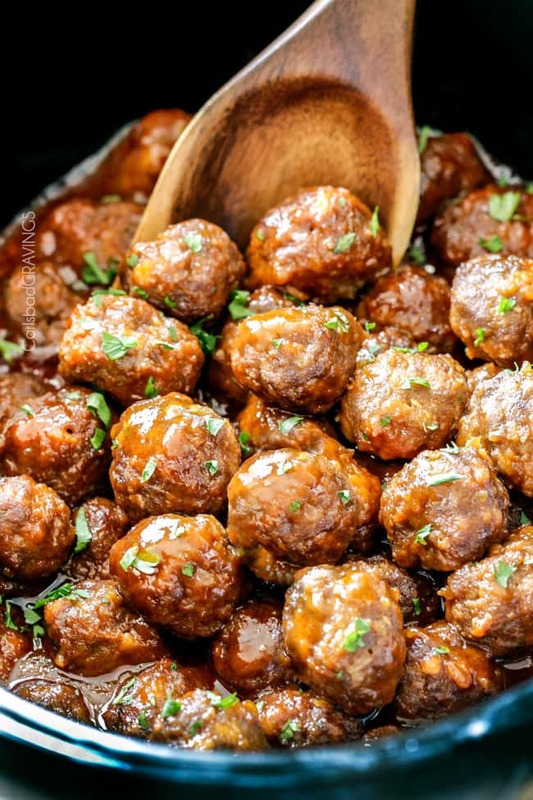 AKA the most addicting party food or dinner EVER and can be made ahead of time! 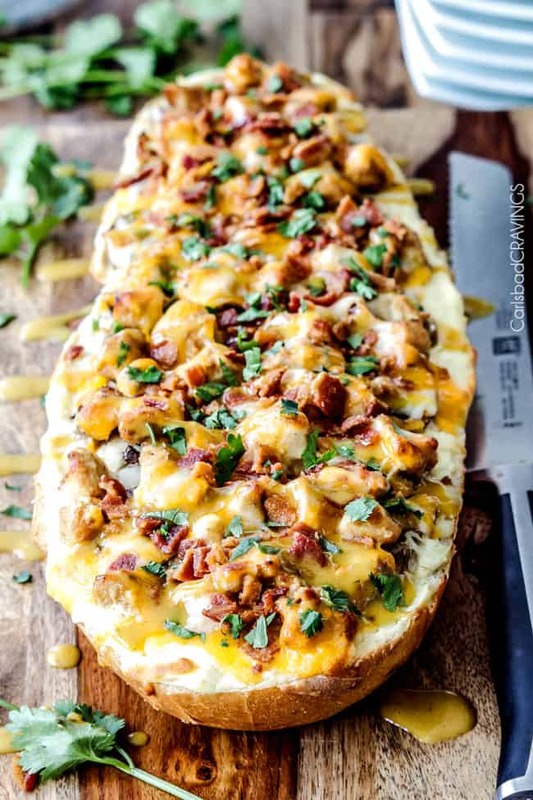 Oh my goodness, I am giddy to share this Alice Springs Chicken French Bread Pizza with you because it is beyond incredible! 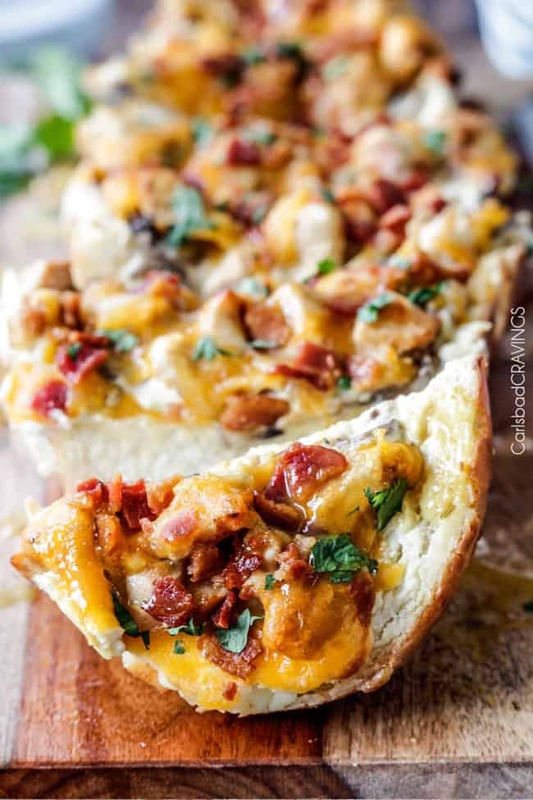 Smothered in cream cheese, topped with tangy honey mustard chicken, mushrooms, bacon, 3 cheeses and drizzled with more honey Dijon sauce. mmmmmmmm……. I have always loved Alice Springs Chicken. If you aren’t familiar with it, its an Outback entree of honey mustard chicken topped with melty cheese, sautéed seasoned mushrooms and chopped bacon. Boy is it naughty – but oh so nice! I hadn’t devoured this bliss in some time until we ate at Outback in Cancun this past August and I ordered my old BFF – Alice Springs Chicken. I had forgotten what I good thing I had been missing these past years but I quickly remembered and then I couldn’t forget. In fact, I couldn’t get the tantalizing flavors out of my mind. 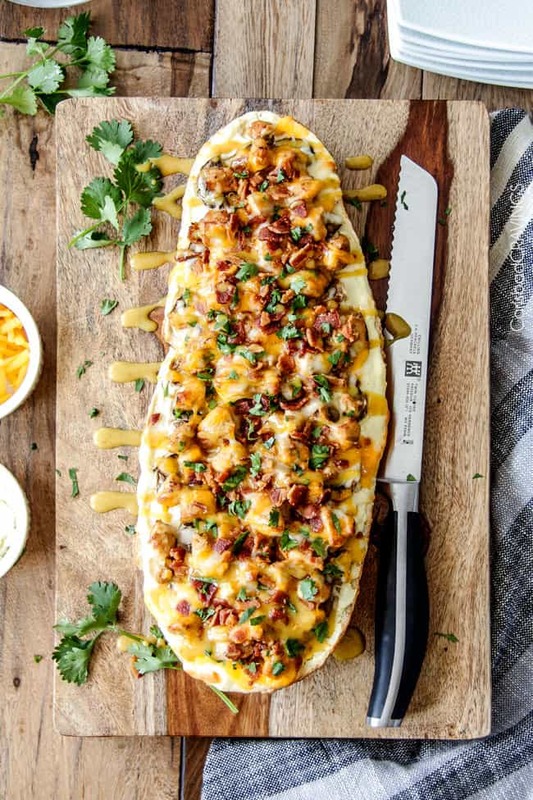 It was that night that I sprung up wide awake after dreaming of Alice Springs Chicken and texted myself, “Alice Springs Chicken French Bread Pizza.” That’s what food bloggers do. 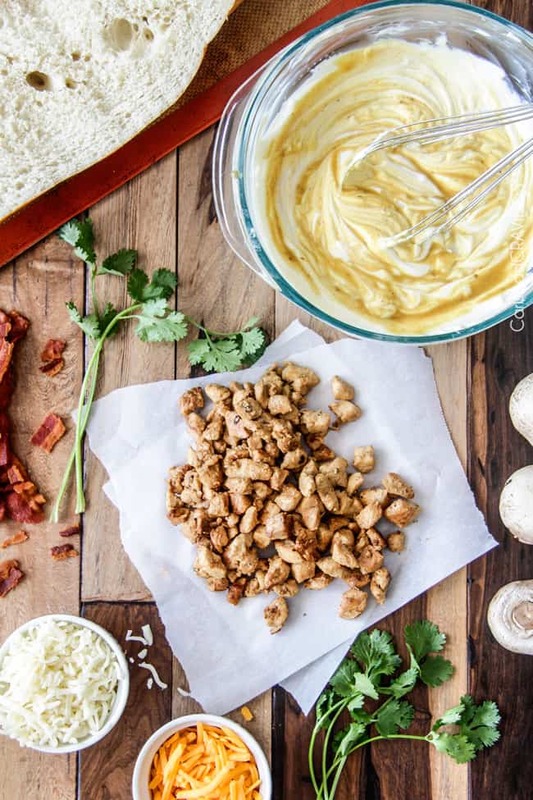 This Cheesy Alice Springs Chicken begins by whipping up a tantalizing Honey Dijon marinade/sauce. You add some of this to marinate your chicken and then stir in more sauce to your chicken once cooked so its seeping with honey Dijon deliciousness. You also whip some of the honey Dijon sauce into your silky cream cheese which you then smother all over your French Bread. 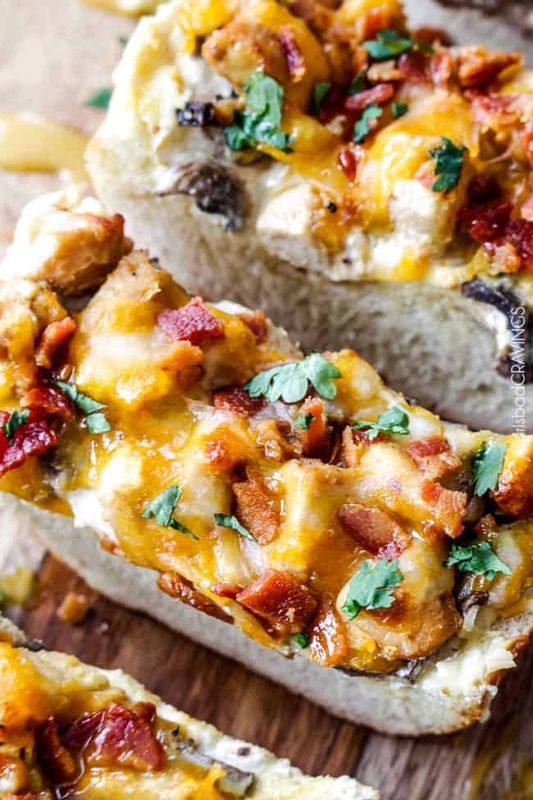 Top your French Bread with your honey Dijon Chicken, thinly sliced mushrooms, 3 cheeses and crown with bacon. 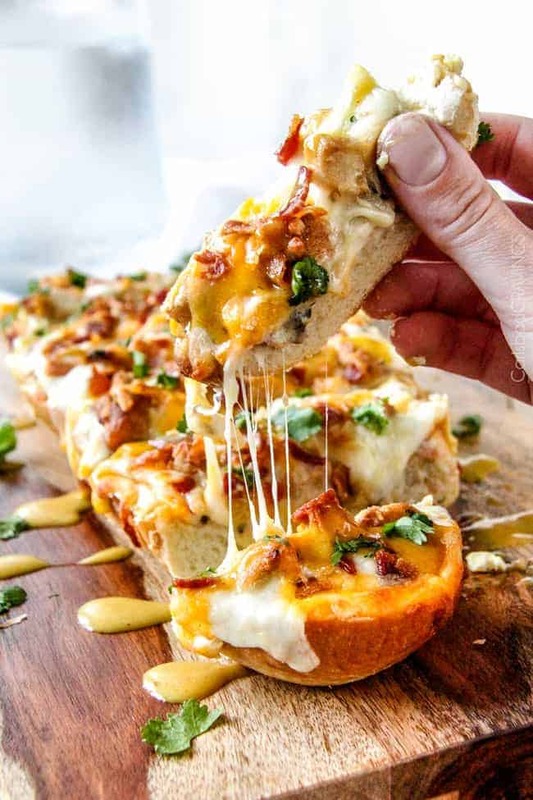 Bake for 12-15 minutes and cheeeeeeesy Alice Spring Chicken French Bread Pizza is ready to be consumed in one sitting. And it will be consumed in one sitting. 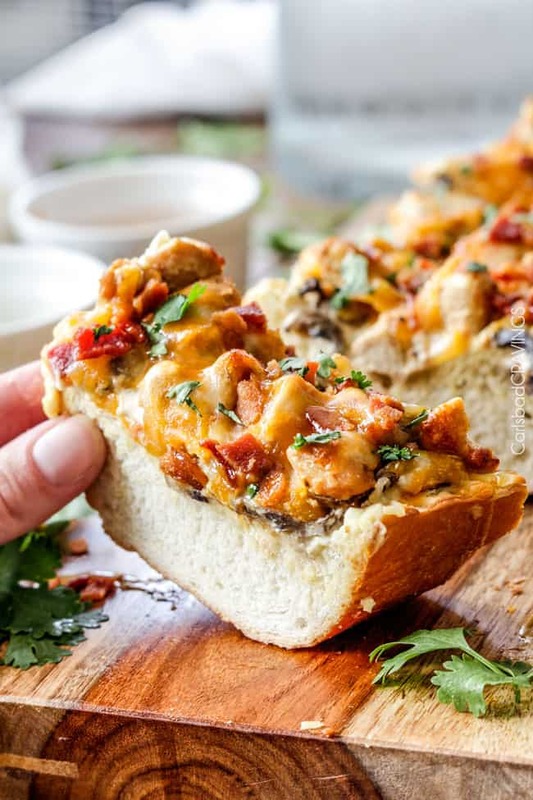 Aside from being crazy delish, this Alice Springs Chicken French Bread Pizza is perfect for parties because you can make it all ahead of time! With just two of us at home, I completely prepped the second French Bread Pizza, wrapped it in foil and baked it days later to satisfy my continuous Alice Springs Chicken cravings and it was just as delicious as the freshly baked French bread! 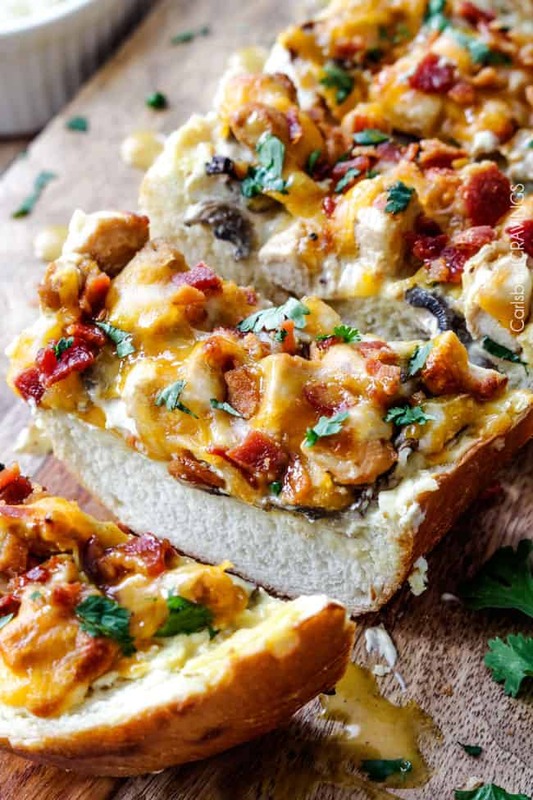 Alice Springs Chicken – now at home, now in easy French bread pizza form, now ready to be eaten all the time – because its so addicting you won’t be able to help yourself! I’m sorry or you’re welcome. Whisk Honey Dijon Marinade/Sauce ingredients together in a medium bowl. Add two tablespoons Marinade to a freezer bag along with chicken. Marinate 30 minutes – 8 hours. (optional)* Refrigerate unused Honey Dijon Sauce separately. Heat 1 tablespoon olive oil over medium high heat. Add chicken and cook until cooked through. Stir in one tablespoon reserved Honey Dijon Sauce. Set aside. Microwave cream cheese in a microwave safe bowl at 30 second intervals, stirring in between until completely smooth. Whisk in 2 tablespoons Honey Dijon Sauce. Spread this Honey Dijon Cream Cheese evenly over each half of French Bread. Evenly top with mushrooms, followed by chicken, then cheeses and finally top with bacon. Bake at 375F degrees for 12-15 minutes or until cheese is melted and slightly golden. Drizzle each French Bread with any remaining Honey Dijon Sauce. Garnish with cilantro if desired. *If you don't have time to marinate chicken, then add 1 extra tablespoon Honey Dijon Sauce to chicken after cooked. 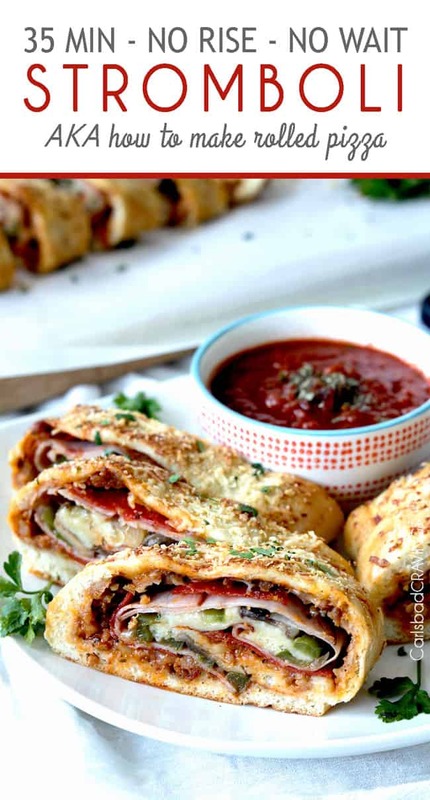 **You can make the entire French Bread Pizza ahead of time. Simply assemble, wrap in foil then bake when ready. Hi Jen! 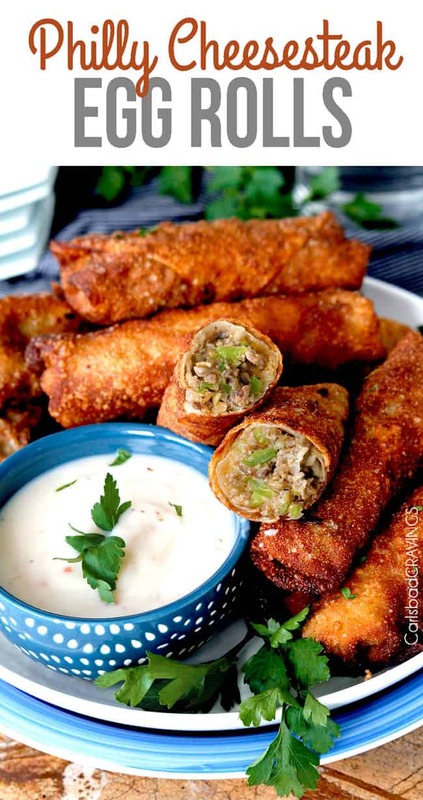 These are making me hungry! I usually prefer thin crust pizza but I also love French bread pizza – I guess I like bread better than dough! Jen, this is genius! I love alice springs chicken and french bread pizza – combining the two?! Yum yum! Also, once again gorgeous photos. Where did you get your wooden slab backdrop? I love it! Can I use a different honey mustard and if so how much would I need? Hi Carol, you are welcome to substitute honey mustard but I am not sure it will taste the same – I would use 6 tablespoons along with the sour cream and mayonnaise. Enjoy!